A table is an entity that is composed of rows and columns, much like a Microsoft Excel spreadsheet. A table entity can be created as an empty table or you can import data from a CSV (C omma S eparated V alues) file. The appearance of the table text and gridlines is controlled with a table style. 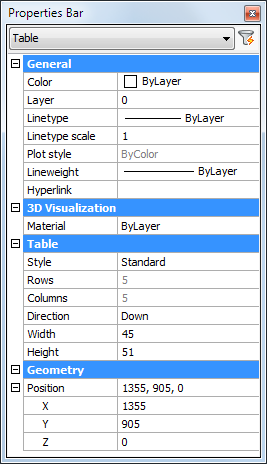 Table styles are saved in the DWG file. A default table consists of a Title cell (A), a row of Header cells (B) and one or more rows of Data cells (C). 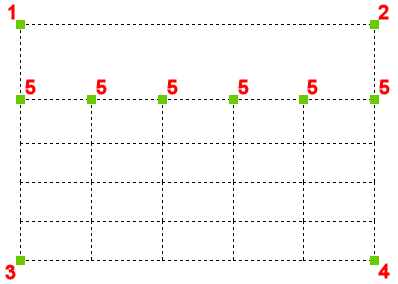 A table can have one of two directions: Down (title row at the top) or Up (title row at the bottom). Table with a Down direction (left) and a Up direction (right). Click the Table tool button ( ) on the Draw toolbar. Choose Insert Table... in the Draw menu. Type table in the command bar, then press Enter. 2. Choose a Table Style from the Table Style list. 3. (option) Set the cell style for the first, second and other rows. By default the cell style for the first row is Title , the cell style for the second row is Header and the cell style for the other rows is Data . 4. Under Table Options , choose Start from Empty Table . Choose Specify Insertion Point , then specify the number of columns and the column width and number of data rows and the row height. Specify the number of columns and data rows. Specify the column width and the row height. Specify the column width and the number of data rows. Specify the number of columns and the row height. Depending on your choice in step 5 you are prompted to specify an insertion point or a window. The table is created and the Text Formatting toolbar displays (see Create multiline text). Start adding text in the table (see Edit the table content). Click outside the table to close the Text Formatting toolbar. When importing data from a CSV (C omma S eparated V alues) file, please make sure the list separator character on your system is the same as the one used in the CSV file (see Defining the list separator character). The Insert Table dialog displays. 3. Under Table Options , choose From Data . 4. Click the Browse button ( ). 5. Choose a CSV file, then press the Open button. 6. Click the OK button on the Insert Table dialog. The dialog box closes and the table is attached to the cursor. 7. Click a point in the drawing to place the table. Start editing the text in the table (see Edit the table content). 9. (option) Select the table and drag the grips to adjust the dimensions of the table. Open the spreadsheet in Microsoft Office Excel . Select the cells you want to create a table from. Press Ctrl + C .
Right click and choose Copy in the context menu. 4. In BricsCAD, choose Paste special... in the Edit menu. 5. 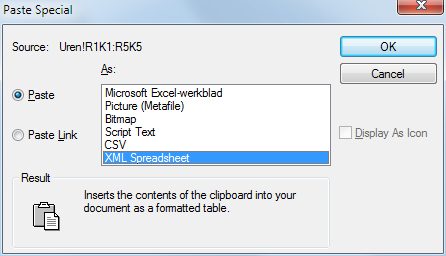 Choose XML Spreadsheet in the As option list. 6. Click in the drawing to insert the table. Modifies the width and height uniformly. Modifies the width of a column. Click the cell you want to edit. Column letters and row numbers display. The column(s) and row(s) of the selection hightlight. A rectangle with four handles is drawn around the selection. Click a cell to select it. Press and hold the left mouse button, then drag the cursor to select multiple cells. 3. (option) Drag the grips of the selection to modify the dimensions. 4. (option) Click a tool in the Table toolbar. Delete Cell Content : deletes the text in the selected cells. Clear Cell Overrides : resets all cell properties of the selected cells to the Cell Style settings as defined in the Table Style. 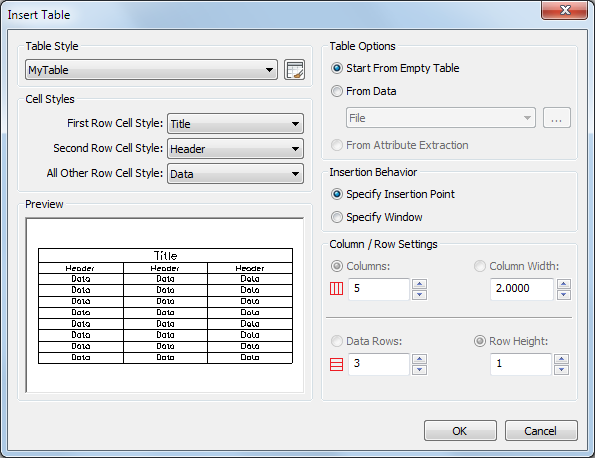 Clear Table Overrides : resets all cell properties of all cells to the Cell Style settings as defined in the Table Style. Inserts an empty row above the selection. Inserts an empty row below the selection. Deletes the row(s) of the selection. Inserts an empty column at the left of the selection. Inserts an empty column at the right of the selection. Deletes the column(s) of the selection. Sets the border style of the selection (not implemented yet). Sets the text alignment of the selection. Locks / Unlocks the selection. Sets the style of the selected cells: Title , Header or Data . Sets the background color of the selection. 6. (option) Repeat steps 3 and 4 to continue editing the table. 7. (option) Double click a cell to edit the cell text. 9. Click outside the table to close the Table toolbar. Click one of the grid lines. The properties of the table display in the Properties bar. 2. (option) Apply a different Table Style. 3. (option) Change the table direction. 4. 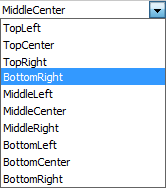 (option) Modify the width and/or height of the table. 5. 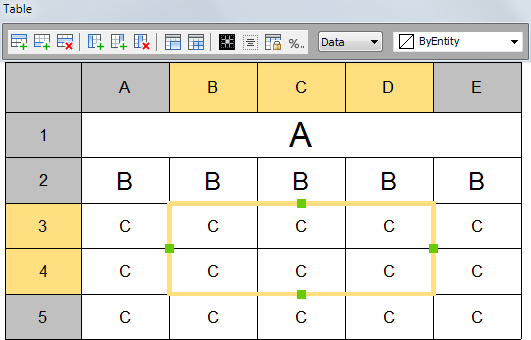 (option) Modify the vertical and/or horizontal cell margins. 6. Press the Esc key to stop editing the table. The properties of the cell display in the Properties bar. 2. 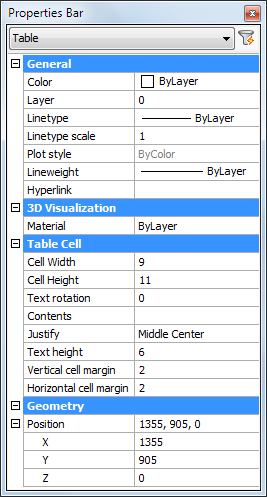 (option) Modify the width and/or height of the cell. The width and height of the column and/or row of the cell are changed. 3. (option) Modify the text rotation. The options are: 0°, 90°, 180° and 270°. 4. (option) Edit the cell content. 5. (option) Choose a different text alignment option. Currently formulas are supported partially. There are more complex formulas which are not supported yet, but in most cases formulas in Excel sheets will remain functional when the Excel sheet is imported as a table. Editing and creating formulas through the field dialog is not supported yet, but in-place editing/creating is possible. E.g. : if you type =SUM(A2:A4) in a cell, it will be interpreted as a formula, and the sum of the valuess in the cells A2 through A4 is calculated. Double click the cell you want to edit. Type tabledit in the command bar, then press Enter and click the cell you want to edit. The Text Formatting toolbar displays above the selected cell (see Create multiline text). 2. Edit the text in thale cell. (option) Press Alt + Enter to create a second line in the same cell. Press the TAB key to go to the next cell in the same row. Press Shift + TAB to go to the previous cell in the same row. Press Enter to go the next cell in the same column. Press Shift + Enter to go to the previous cell in the same column. Press one of the Arrow keys. 4. Click to stop editing the table content. When exporting data to a CSV (C omma S eparated V alues) file, the list separator character off your system is used in the CSV file (see Defining the list separator character). Type tableexport in the command bar, then press Enter. Click the table you want to export the data of. The Export Data dialog opens. Select a folder to save the data in. Type a name in the File name field. The data in the selected table are saved as a CSV (C omma S eparated V alues) file. Click the Start button in the Windows Taskbar, then choose Control Panel . On the Control Panel Home window, choose: Clock, Language and Region > Regional and Language Options . On the Control Panel Classic View window, double click the Regional and Language Options icon. The Regional and Language Options dialog box displays. 3. On the Regional and Language Options dialog box click the Customize this format... button. 4. 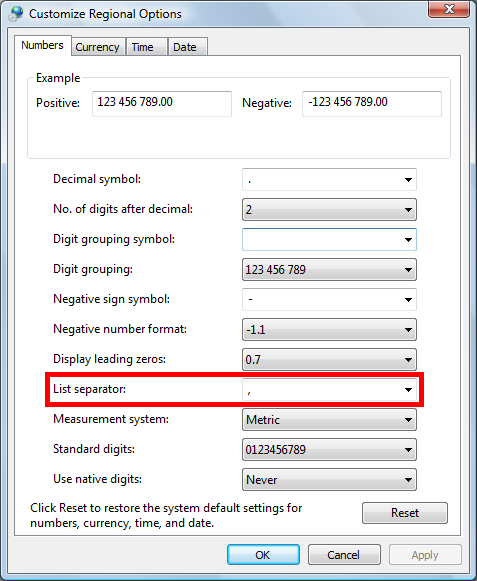 On the Numbers page of the Customize Regional Options dialog box, go to List separator , then click the down arrow and select either comma (,) or semicolon (;). 5. Click the OK button on the Customize Regional Options and Regional and Language Options dialog boxes.